Increase brand presence of Ferrero Rocher and to promote the sale of Ferrero Rocher chocolates as a Chinese New Year gift. The strategic challenge was to build the brand profile of Ferrero Rocher across Chinese speaking markets. We provided deep cultural insights to support promotional activity for Chinese New Year. Insights were used to refine Ferrero’s CNY branding, advertising, point of sale, packaging and shopping centre activations. Culturally relevant taglines were written for Chinese speaking audiences to ensure the Ferrero Rocher message would be authentic and appealing in an Australian market. 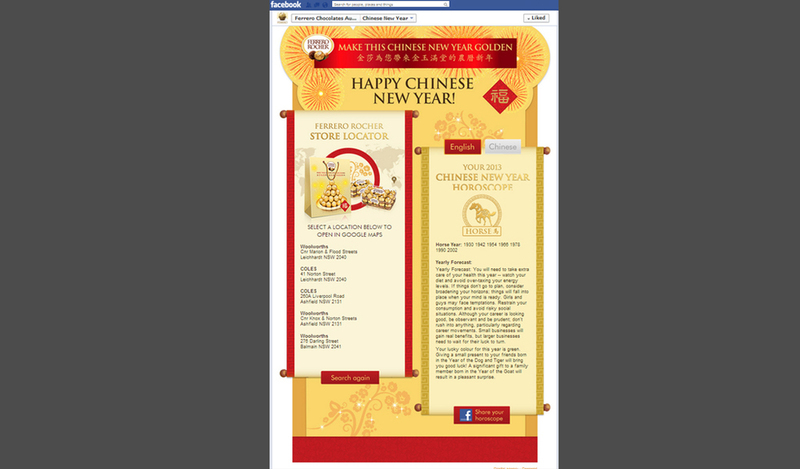 We also developed an original Facebook campaign that included a Chinese horoscope app featuring content created by an Australian-based Feng Shui Master and a store locator to direct sales. The campaign was original and creative resulting in a high level of engagement from the Chinese community. The 2013 campaign helped to establish the Ferrero Rocher products in the CNY gift market and led to Ferrero repeating the campaign in 2014.